IP is ushering in a whole new era for the business of broadcasting. New IP-based paradigms, such as virtualization, internet-based content delivery, and cloud-based operations, will deliver significantly lower CAPEX and OPEX and offer promising new revenue-generating opportunities. But to get there, broadcasters have a critical need for efficient and easy-to-use solutions, delivered at the lowest-possible cost of ownership and with the smallest-possible equipment footprint. Whether the operation is focused on news and weather, live production, sports, or in-venue productions, the key to success is all-software workflows that run in a standardized IT infrastructure. In news and weather, it’s all about efficiencies. Broadcasters, especially those in highly competitive news markets, are challenged like never before to grab audience share and tell stories in new and compelling ways. Since stations are no longer just producing segments for twice-a-day on-air newscasts but also any number of social media and internet platforms, the news teams are in operation 24/7. Therefore, they need tools to help them produce greater quantities of engaging content and then deliver it as fast as possible to multiple platforms and in different formats. At the same time, broadcasters need the ability to keep their editorial teams focused on the content and not the underlying technical complexities, even as emerging technologies like IP, HDR, and 4K make broadcast operations more complex than ever. All-software ecosystems of solutions address these challenges by giving broadcasters the ability to deploy producer-driven news production workflows, with producers and journalists involved directly in the process of creating, managing, and playing out content to air. By migrating away from proprietary hardware and towards all-IT, software-based production environments, broadcasters can empower larger numbers of non-technical personnel to create and play out quality content. Also, new capabilities for pushing content directly to social media outlets can make getting news to viewers faster and easier than ever before. These kinds of software-based tools have tremendous potential in any type of live production environment. One area that can benefit is OTT delivery. In today’s typical broadcast environment, OTT is a separate function from the main production operation, with the OTT team focused on pushing content to internet platforms. By unifying the OTT and main production teams, a software ecosystem can remove inconsistencies and duplicated effort. Virtualization is another area in which the IP revolution is transforming live production, bringing new levels of scalability, flexibility, and revenue-generating opportunities. For a one-time live broadcast of a special event, for instance, a broadcaster can spin up a complete production workflow and a “pop-up” channel at a moment’s notice. There’s no more need to invest in addition hardware for peak hours that will simply sit idle during slower times; users can simply buy the capacity they need on a per-hour basis. Broadcast graphics are another big beneficiary of software- and IT-based production environments. Bold and attention-grabbing graphics are critical in the ongoing effort to capture and hold audience share, and broadcasters need solutions that meet their requirements today while paving a future-proof path to new and emerging formats and technologies. One approach is a universal graphics platform, such as ChyronHego’s PRIME, that stacks an array of diverse applications into a single design, authoring, and playout solution. 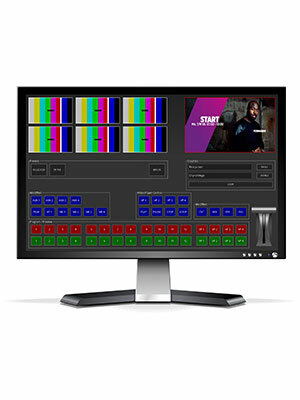 Such a software-based approach allows broadcasters to take full advantage of the latest in IP-based workflows and in deliver the rich high-resolution, high-dynamic-range images that give productions a competitive edge. Finally, we’re seeing an ongoing convergence of sports broadcasting and stadium/in-venue productions, particularly as fans expect the same immersive experience in the stadium that they’ve come to enjoy while watching a game at home on television. As this expectation continues to grow, stadiums and sports teams know they need to up their game – and that means delivering ever-more-sophisticated in-venue presentations. In many cases, they’re taking their cue from sports broadcasters who have applied advanced player tracking data, such as that supplied by ChyronHego’s TRACAB software, to enhance the sports viewing experience. At the 2018 Sports Innovation Days in Dusseldorf, Germany, we successfully demonstrated Perimeter Tracking. Built around our TRACAB player tracking and Click Effects PRIME solutions, Perimeter Tracking camera-tracks a player in parallel to the football perimeter, or pitch-side, LED display. Perimeter Tracking presents a player’s speed, total distance covered, and other stats live in-stadium, and opens up new opportunities for advertiser-supported fan engagement. While sports is but one segment of the overall broadcast/production industry, it typically utilizes the most advanced technology and is a driver for other aspects of broadcasting simply because it attracts such a large viewing audience. But the lessons of IT- and software-based production – and their tremendous potential for expanding audience share and revenue generation – apply not only to sports but to every aspect of live production.